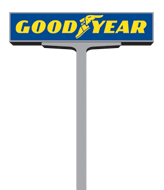 Help lower your fleet's operating costs with Goodyear. Choose the right program, tires, tools and innovations to start saving money today. Lower your operating costs with innovative Goodyear tires and seamless UniCircle® retreads. Tap into Goodyear's powerful network of Dealers for support on the road. *Fleet research study, Nov. 2015, Lieberman Research Worldwide. 590-fleet sample. Goodyear Dealer network roadside service compared to Michelin, Bridgestone and Continental. Streamline your work, make more informed decisions and save money. Start with practical online tools and customized support through Goodyear Fleet HQ®. Do you manage a fleet? This video shows how Goodyear's Total Solution can help!